Groundhog Day is a 1993 film about a weather man doomed to repeat the same day over and over again. Directed by Harold Ramis. Written by Danny Rubin and Harold Ramis. He's having the worst day of his life... over, and over again. Once again, the eyes of the nation have turned here to this... tiny village in western Pennsylvania. Blah, blah, blah, blah, blah. There is no way this winter is ever going to end, as long as this groundhog keeps seeing his shadow. I don't see any other way out. He's got to be stopped. And I have to stop him. Sometimes I wish I had a thousand lifetimes. I don't know, Phil. Maybe it's not a curse. Just depends on how you look at it. DJ #1: Okay, campers, rise and shine and don't forget your booties 'cause it's cold out there today! DJ #2: It's cold out there every day! What is this, Miami Beach? D.J. #2: That blizzard - thing. That blizzard - thing. Oh, well, here's the report! The National Weather Service is calling for a "big blizzard thing!" D.J. #1: On their chapped lips, right: Do ya think Phil is gonna come out and see his shadow? Ned: Phil? Phil Connors? Phil Connors, I thought that was you! Phil: Hi, how are you doing? Thanks for watching. Ned: Hey, hey! Now don't you tell me you don't remember me 'cause I sure as heckfire remember you! Ned: Ned Ryerson! "Needlenose Ned"? "Ned the Head"? Come on, buddy, Case Western High! Ned Ryerson — I did the whistling belly-button trick at the high school talent show? Bing! Ned Ryerson — got the shingles real bad senior year, almost didn't graduate? Bing again! Ned Ryerson — I dated your sister Mary Pat a couple of times until you told me not to anymore? Well? Ned: No, Phil, I sell insurance. Gus: No tomorrow? That would mean there would be no consequences, there would be no hangovers. We could do whatever we wanted! Phil: That's true. We could do whatever we want. Gus: [sobering up] Well, Phil. That’s one I happen to agree with. Phil: [driving into the rail tracks] I don’t know, Gus… Sometimes, you just have to take the big chances. Rita: I'm sorry? What was that again? Phil: I'm a god — I'm not the God, I don't think. Rita: Because you survived a car wreck? Phil: I didn't just survive a wreck; I wasn't just blown up yesterday. I have been stabbed, shot, poisoned, frozen, hung, electrocuted and burned. Phil: [nods] Every morning I wake up without a scratch on me, not a dent in the fender: I am an immortal. Rita: Why are you telling me this? Phil: Because I want you to believe in me. Rita: You're not a god. You can take my word for it; this is 12 years of Catholic school talkin'. Phil: How do you know I'm not a god? How do you know? Rita: Because it's not possible! Rita: There is something so familiar about this. Do you ever have déjà vu? Rita: What about me, Phil? Do you know me too? Phil: I know all about you. You like producing, but you hope for more than Channel 9 Pittsburgh. Rita: Well, everyone knows that! Phil: You like boats, but not the ocean. You go to a lake in summer with your family up in the mountains. There's a long wooden dock and a boathouse with boards missing from the roof, and a place you used to crawl underneath to be alone. You're a sucker for French poetry and rhinestones. You're very generous. You're kind to strangers and children, and when you stand in the snow you look like an angel. Rita: How are you doing this? Phil: I told you. 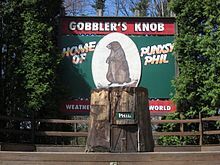 I wake up every day, right here, right in Punxsutawney, and it's always February 2nd, and there's nothing I can do about it. Rita: Why can't I see it? Phil: I just want to give you your money's worth. You paid top dollar for me. Rita: Well... I think you were a bargain. Phil: It's sweet of you to say. You're probably right. Phil: [talking to a sleeping Rita] I think you're the kindest, sweetest, prettiest person I've ever met in my life. I've never seen anyone that's nicer to people than you are. The first time I saw you... something happened to me. I never told you but... I knew that I wanted to hold you as hard as I could. I don't deserve someone like you. But if I ever could, I swear I would love you for the rest of my life. Rita: [muttering in her sleep] Did you say something? Rita: I’m amazed. And I’m not easily amazed. Rita: About how you can start a day with one kind of expectation and end up so completely different. Phil: Well, do you like how the day is turning out? Rita: Very much. You couldn’t plan a day like this. Phil: Well, you can. It just takes an awful lot of work. Phil: Anything different is good. But this could be real good. [kisses Rita] Why are you here? Rita: I bought you. I own you. Phil: But why are you still here? Rita: You said, "Stay," so I stayed. Phil: I said, "Stay," so you stayed? I can't even make a collie stay. Phil: Today is tomorrow. It happened. You're here. Rita: [smiling] Oh Phil, why weren't you like this last night? You just fell asleep. Phil: It was the end of a very long day. Groundhog Day is such a clever, wonderful ride that you don't notice the joins. It's rare for a comedy to be funny and profound but also popular. … Groundhog Day is living proof that it's possible to create intelligent comedy that still has a broad appeal. With so many movies, especially comedies, you can see the bones sticking out – you can see what they're trying to do. But Groundhog Day is such a clever, wonderful ride that you don't notice the joins. It's rare for a comedy to be funny and profound but also popular. Films such as Groundhog Day and Back to the Future sold a lot of popcorn, but they were insanely smart too. That's very inspiring when you're sitting there trying to write a comedy screenplay. Groundhog Day is living proof that it's possible to create intelligent comedy that still has a broad appeal. Groundhog Day is now associated in the minds of many spiritual seekers with redemption, rebirth and the process of moving to a higher plane. Professor Angela Zito, the co-director of the Centre for Religion and Media at New York University, told me that Groundhog Day illustrated the Buddhist notion of samsara, the continuing cycle of rebirth that individuals try to escape. In the older form of Buddhist belief, she said, no one can escape to nirvana unless they work hard and lead a very good life. But in the teachings of the slightly more recently established Mahayana Buddhism, no one can escape samsara until everyone else does. "That's why you have what are called bodhisattvas who reach the brink of nirvana and come back for others," she said. "The Dalai Lama is considered one living bodhisattva, but Bill Murray could also be one." Formula comedies are a dime a dozen. Those based on an original idea are more rare, and "Groundhog Day," apart from everything else, is a demonstration of the way time can sometimes give us a break. Just because we're born as SOBs doesn't mean we have to live that way. Groundhog Day is a film that finds its note and purpose so precisely that its genius may not be immediately noticeable. It unfolds so inevitably, is so entertaining, so apparently effortless, that you have to stand back and slap yourself before you see how good it really is. A long article in the British newspaper the Independent says "Groundhog Day" is "hailed by religious leaders as the most spiritual film of all time." Perhaps not all religious leaders have seen anything by Bergman, Bresson, Ozu and Dreyer, but never mind: They have a point, even about a film where the deepest theological observation is, "Maybe God has just been around a long time and knows everything." What amazes me about the movie is that Murray and Ramis get away with it. They never lose their nerve. Phil undergoes his transformation but never loses his edge. He becomes a better Phil, not a different Phil. The movie doesn't get all soppy at the end. There is the dark period when he tries to kill himself, the reckless period when he crashes his car because he knows it doesn't matter, the times of despair. We see that life is like that. Tomorrow will come, and whether or not it is always Feb. 2, all we can do about it is be the best person we know how to be. The good news is that we can learn to be better people. There is a moment when Phil tells Rita, "When you stand in the snow, you look like an angel." The point is not that he has come to love Rita. It is that he has learned to see the angel. 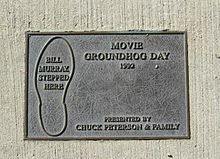 Groundhog Day, the 1993 film Ramis directed and co-wrote with Danny Rubin, became an underground Buddhist classic, despite the fact that the words “Buddhist” or “Buddha” never appear in the script, or that neither Ramis nor Rubin intended it to be Buddhist or Christian or Jewish or any of the other denominations that say it speaks to them and for them. And despite the fact that the film is, after all, a comedy. A comedic take on Buddhism? That alone could earn merit points these days when many Buddhist meditators and scholars seem to have forgotten the light touch of numerous teachers over the centuries. And, typical of a Ramis film, change means Phil becomes the good guy, the bodhisattva who performs selfless acts of kindness, not manipulatively, but for their own sake. This, naturally, wins him the love of the whole town, and, naturally, of Rita. And not surprisingly, he comes to love himself. Ramis gets a kick out of the fact that many religious groups claim the film is for and about their particular sect. I suspect Ramis and the Buddha would agree: 'The more, the merrier." Ramis himself is not a Buddhist, does not meditate but is well read on the principles and consciously practices the simple tenets that weatherman Phil Connors comes to embody (picture a bald Bill Murray in saffron robes). Ramis, I learned from hanging out with him and interviewing many around him, is somewhere between a mensch (a really good guy) and a boddhisatva (a really good guy whose mission is to help other people become really good guys). I believe Groundhog Day is a Buddhist movie because of this "transformation" of the Bill Murray character. He becomes, as we would say in Jodo Shinshu Buddhism, "a true human being," as opposed to the self-centered and arrogant person he started out as. What is important to note is that the transformation occurs not through the action of some external supreme being, or through the action of the Bill Murray character himself (i.e., through his own self-power). It occurs because he encounters a difficulty in his life that is greater than himself. In Jodo Shinshu Buddhism, we are taught that, even if we are aware that our ego-self is the problem, we cannot simply decide to become a "good person." The self cannot correct itself. What is required is a power much greater than the self, which essentially "negates" or "challenges" the self. In Buddhism, we call this power the Dharma. What's so remarkable about it … is that normally when you're writing a screenplay you try to avoid repetition. And that's the whole thing here, it's built on repetition. That's so bold. The way they get through it is to short-circuit everything, so just when you think something is going to happen that you've seen before, the film gets to it before you and changes or abbreviates it in some way. I saw it when it came out and it just took my breath away. Since its debut a decade ago, the film has become a curious favorite of religious leaders of many faiths, who all see in Groundhog Day a reflection of their own spiritual messages. … Harold Ramis, the director of the film and one of its writers, said last week that since it came out he has heard from Jesuit priests, rabbis and Buddhists, and that the letters keep coming. "At first I would get mail saying, 'Oh, you must be a Christian, because the movie so beautifully expresses Christian belief,' " Mr. Ramis said during a conversation on his mobile phone as he was walking the streets of Los Angeles. "Then rabbis started calling from all over, saying they were preaching the film as their next sermon. And the Buddhists! Well, I knew they loved it, because my mother-in-law has lived in a Buddhist meditation center for 30 years and my wife lived there for 5 years." … Angela Zito, a co-director of the Center for Religion and Media at New York University, screens the film for students in her Buddhism class. 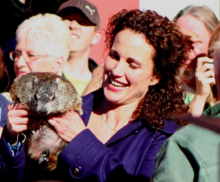 She said that Groundhog Day perfectly illustrates the Buddhist notion of samsara, the continuing cycle of rebirth that Buddhists regard as suffering that humans must try to escape …Groundhog Day, Dr. Zito said, is a cinematic version of the teachings in Mahayana Buddhism, known as "the greater vehicle." "In Mahayana," she said, "nobody ever imagines they are going to escape samsara until everybody else does. That is why you have bodhisattvas, who reach the brink of nirvana, and stop and come back and save the rest of us. Bill Murray is the bodhisattva. He is not going to abandon the world. On the contrary, he is released back into the world to save it." Some theologians see much less Buddhism in the story than Judaism. Dr. Niles Goldstein… said he finds Jewish resonance in the fact that Mr. Murray's character is rewarded by being returned to earth to perform more mitzvahs — good deeds — rather than gaining a place in heaven, which is the Christian reward, or achieving nirvana, the Buddhist reward. He has not used the movie as an allegory for his congregation, he said, but he might now. "The movie tells us, as Judaism does, that the work doesn't end until the world has been perfected," Rabbi Goldstein said. Michael Bronski, a film critic for The Forward who teaches a course in Jewish film history at Dartmouth, said he sees strong elements of not only Jewish but also Christian theology. "The groundhog is clearly the resurrected Christ, the ever hopeful renewal of life at springtime, at a time of pagan-Christian holidays," he said, adding: "And when I say that the groundhog is Jesus, I say that with great respect. "… Yogis, Jesuits and psychoanalytic practitioners have told Mr. Ramis that they feel a strong spiritual kinship with the message they see in the film. In the case of the psychoanalysts, he said, "it's the 'we keep reliving the same old patterns over and over again until we gain the right to free ourselves' thing." And in Washington, a branch of the Chinese spiritual movement Falun Dafa, also known as Falun Gong, has used the movie to instruct members in its belief that the spiritual self is not allowed to move to higher levels until it learns from past mistakes. … Some Wiccans also point to the film as particularly important to their beliefs, because Groundhog Day — the day itself — is one of the four "greater sabbats" that divide the year at the midpoints between the solstices and equinoxes. Several Web sites devoted to Wicca call the movie required viewing. Mr. Murray is back in top form with a clever, varied role that draws upon the full range of his talents. As in Scrooged, he makes a transition from supreme cynic to nice guy, and this time he does so with particularly good grace. Half Capra and half Kafka, the story of Groundhog Day presents golden opportunities, particularly in the gently romantic scenes with Ms. MacDowell. Mr. Murray is as believable and appealing at these moments as he is flinging insults. Ms. MacDowell, a warm comic presence and a thorough delight, plays a modern working woman while also reminding viewers that this is at heart a fairy tale. As Phil tries one desperate tactic after another, fairy tale fans will be way ahead of him, knowing what it takes to break a spell. It always seemed ironic to me that it didn’t lead people to recognize the commonality of all their points of view, but rather, "This must be about us and only us." Ever since the movie "Groundhog Day" came out in the early '90s, many people, especially Buddhists, feel that the movie holds some kind of profound, existential message concerning spiritual practice and the spiritual path. … I doubt that the producers of the movie ever intended their lighthearted comedy to become a lesson in Buddhist teaching, but so it goes. There have been a lot of messing-with-time movies where you can't help but see the influence of Groundhog Day … Every time it happens, my friends say: "You just got ripped off. I hope they paid you." I'm, like: "No, it's an homage." It's not like I'm being erased. It's an honour. I always thought the premise could be explored a million different ways. I welcome all of these explorations; it's fun for me because I like to see how other people play with the idea. Basically it shows how ubiquitous it's become in the culture. It's getting harder and harder now to find anyone who hasn't seen it. It's perfect in its structure, and its ideas are so profound. Very much like Silver Linings Playbook, it's about someone fighting their demons using all that humble, difficult, baby-steps hard work that it takes, but doing it in such a hilarious way. It shows that until you wake up and get things right, you're gonna live that stuff until you die: the same emotional prison every day. Phil has to go through every incarnation of what he thinks love is until he really gets it. All those films reinvent structure and create a new conceptual framework that makes you understand them … They share an almost surrealistic vision, and they pose philosophical questions. Groundhog Day is there primarily to entertain, but there are lots of really intelligent ideas in it. It makes me think of Deleuze and his thoughts on how change can arise from repetition. The film follows that to the letter. … I thought straight away that it was a classic … other generations will understand immediately what's so good about it. To me, it's a perfect film. This page was last edited on 9 April 2019, at 20:31.